The following presents materials toward Kabbalat Shabbat: the Grand Unification, revealing Debra’s own mode of founding Jewish art on Jewish learning. Translation of Kiddush © Raymond P. Scheindlin 2013, Essay and images © Debra Band 2013. All rights reserved. The version below omits the footnotes that will be present in the published book. for that was when He rested from making all the things that God created. Blessed are you, Lord our God, who created the fruit of the vine. a remembrance of the work of creation. a remembrance of the Exodus from Egypt. and made Your holy Sabbath ours in love and pleasure. Blessed are You, Lord, who makes the Sabbath holy. The vessels through which the wine flows symbolize the ten sephirot, or emanations of God, and the mystical tradition assigns each one a characteristic color. 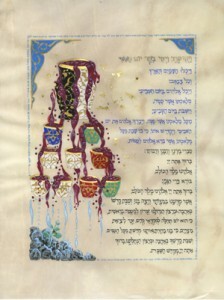 Thus, beginning at the top with the uppermost sephira, Keter (Crown), and then moving from right to left (following Hebrew convention), the painting presents the sephirot as the wine cups, the vessels through which Divine Wisdom flows: Keter-white and black, Binah-green, Hokhma-blue, Gevurah-red, Hesed-white, Tifereth-white, Hod, green, Netzach-red, Yesod-white, and closest to the material world, Malkhut (Shekhinah)-white. The arrangement of the cups through which the wine flows alludes to the human understanding of order in the universe. 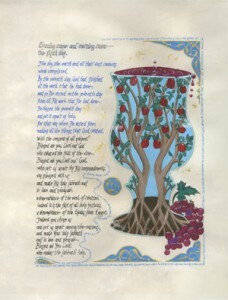 Just as the Kabbalistic system ascribes the number ten cosmic significance—for instance, the ten Sephirot—Pythagorean philosophy also regarded the number ten as holy, and held the tetractys, the pyramid formed by the “generators of geometric dimensions” in which I have arranged the cups, as emblematic of unity in the universe. The four levels of this Pythagorean pyramid trace the development of geometric form as follows: level 1-the element establishing a single point, level 2-two points determining a line, level 3-three points determining a plane, and 4-four points determining a tetrahedron, the simplest three-dimensional form. The water flows down into the material world, tumbling over boulders, perhaps into a mountain stream. Ezra also compared rough boulders to Wisdom. Why does Wisdom remind the mystic of rocks? The stony cracks and fissures symbolize the task of looking for Wisdom in hidden, hard places.